The great Scottish Laird MacDonald made it a habit to walk along the top of the castle walls every night before going to bed. He said it made him sleep better. It was on one of his nightly walks when he felt two great chills. One was on the outside, and one was on the inside. 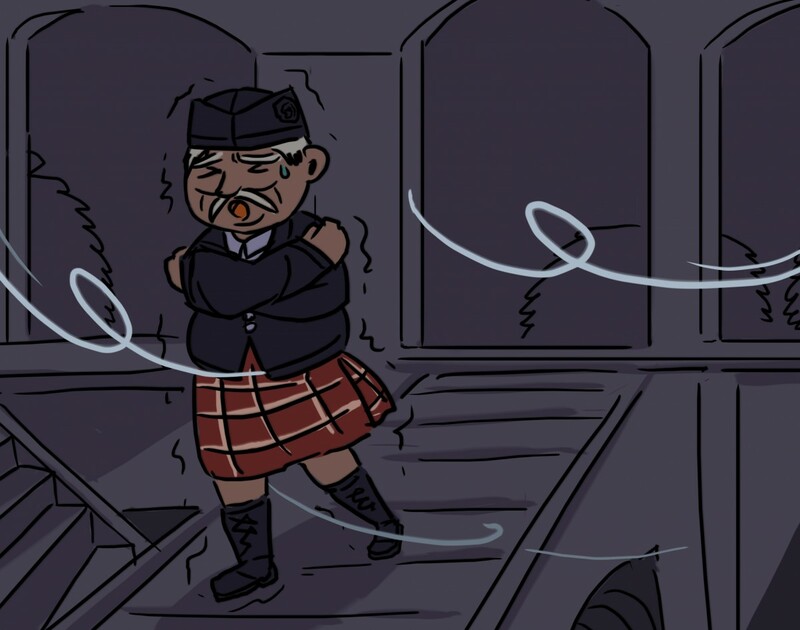 The outer chill was caused by the cold night wind blowing up under his plaid kilt. He had grown a bit older and the cold bothered him more than it used to. The other chill was felt inside when he saw an eerie glow coming from the windows of the village church a few miles away from where he stood. He thought he heard a wailing and moaning sound coming from the direction of the church. He believed the nearby church was haunted by a terrible monster that came out every night just as the sun set. MacDonald stood shivering and thought of an idea that could get rid of both of his chills. He would trade in his kilt for a new type of clothing called "trews". The trews, or trousers, would be much warmer when walking around the castle in the cool evening air. That could help him with outer chill. The other chill would be taken care of by the tailor he would hire to make his trews. MacDonald summoned the tailor to the castle. "Measure me for trews. Then off you go to somewhere special to sew them." "Where would that be?" asked the Tailor. "Instead of going all the way home, I want you to sew my new trews in the village church. I'll pay you extra for doing the sewing while sitting among the tombstones. That way I can get my trews and find out what is haunting the church at night without going there myself." The tailor heard this and had a chill of his own. He had no desire to see any creature that haunted a church. But, the money sounded good. He got up his courage and agreed to start the trews right away. The Laird believed it would take him well into the night to sew the trews. But, the tailor planned on sewing fast enough to be done before any spirits came out to bother him. The tailor went to the church. He walked through the iron gate in the cemetery and laid out his fabric on a marble monument. He cut it according to the Laird's measurements before going inside the church. The sun was high in the sky when he entered the church and started sewing the trews. The church was quiet. Nothing unusual could be seen or heard. The tailor was starting on the second leg as the sun disappeared from the sky. The tailor lit a candle and continued sewing at a steady pace with nice even stitches. Suddenly, the floor began to shake. The needle slipped from between the tailor's fingers, and he dropped his thimble. He kneeled to pick it up and saw something strange. At the front of the church the tiles moved apart, and what looked like a new grave appeared. The grave began to open up. Out came a large and very ugly head. "Do you see this head of mine?" it asked. "I see that, but I'll sew these," said the tailor as he held up the trews. He pretended not to look and kept on working. The head rose higher out of the grave. "Do you see this great neck of mine?" asked the head. "Aye, I see that, but I'll sew these," said the tailor. He pretended not to look while he turned the trews inside out and stitched the waistband. The earth opened more. Large shoulders and the torso of the man rose out of the grave. "Do you see this great chest of mine?" asked the creature. "Aye, I see that, but I'll sew these," said the tailor. He stitched faster. His stitches were not quite as even as before and were not a neat as usual. The moon was high in the sky by then, and the trews were still not done. The tailor wanted to run. But he knew he would not get paid if he did not finish the trews in the church as promised. Two long arms rose out of the grave and reached towards the tailor as the creature's waist came out of the grave. "Do you see these strong arms of mine?" "Aye, I see those, but I'll sew these," said the tailor. His stitches came faster and they were farther apart than before. His hands flew across the material. The creature groaned loudly and pulled one leg up out of the grave. "Do you see this long leg of mine?" asked the creature. "Aye, I see that, but I'll sew these," said the tailor. He sewed the last several stitches in the trews then tied and knotted the thread. He blew out the candle as the second leg came out of the grave. The creature started his way. The Tailor grabbed his sewing bundle in one hand and the trews in the other and stepped towards the door. As he stepped, he heard the sound of footsteps behind him. The tailor walked faster. The footsteps went faster. The tailor opened and closed the church door. He was half way across the graveyard when he heard the door open and slam behind him. He began to run through the gate and across the glen towards the castle. He heard the iron gate on the cemetery squeak and heard the loud running footsteps getting closer to him. The tailor did not dare to look back and ran towards the great castle. The great Laird MacDonald saw the tailor coming and saw a huge creature gaining on him. MacDonald called for the gates to be opened, and just in time. The tailor made it inside the castle, and the doors were closed and bolted just as the large creature reached out a hand and slapped at the wooden door while trying to catch the tailor. MacDonald paid the tailor well for the trews, including the bonus for doing the sewing in the church. The Laird ended both of his chills. The outer chill stopped when he replaced his kilt with trousers or trews. The inner chill ended when he asked the parson to sprinkle holy water on the place where the creature emerged from the ground. The tailor never told anyone about what had happened. But, then again, he didn't have to. Everyone knew about the creature that chased him. They knew because of the large handprint that was pounded into the castle door that night.